Martin Scorsese and Leonardo DiCaprio have made fantastic movies together, like Gangs of New York and The Departed, which are two of my favorites. They’ve made three movies, all of which were nominated for Oscars. My expectations for their fourth were high. Did it live up to those expectations? For the most part, no. 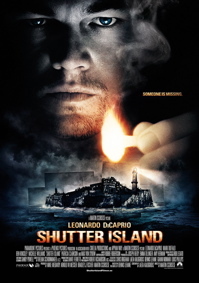 Shutter Island is about federal marshal Teddy Daniels (DiCaprio) and his partner, who are investigating the disappearance of an insane asylum patient. Later it’s revealed that Daniels took the case to find his wife’s killer and to expose the asylum for doing illegal experiments. This movie was excellent for about the first hour and a half, but the last 45 minutes were flawed. It’s psychologically thrilling with small things, like a woman picking up a glass to drink and the glass suddenly disappearing as she drinks, but reappearing when she puts it down. It also has some very good effects for Teddy’s hallucinations of his dead wife, like when she is crumbling into ash in Teddy’s arms. The acting is also very believable, especially DiCaprio, who has come a long way from being the pretty boy Romeo in Romeo + Juliet to the gritty, mentally unstable Daniels of this film. Now that we’ve been over the positives, this movie is by no means perfect. This may just be a result of being jaded from so many other horror movies and thrillers, but the majority of this movie is not scary. On top of this, some of the “scares” are ridiculous. There’s one scene where Teddy is at the bottom of a cliff and hundreds of rats come out of a hill, which is unnerving because the sound of all of the rats is outstandingly irritating, but isn’t actually scary. I also got so caught up in trying to solve the mystery that instead of noticing things like DiCaprio’s performance or the little things that make the movie just that much eerier, I was mainly looking for clues about what the big reveal could be. My biggest problem with this movie is the big reveal during the film’s climax. I can’t say exactly what happens, but I can say that it’s a disappointment. The resolution of the movie makes up for this a little bit by giving the movie a sense of ambiguity, but it doesn’t change the let down of a reveal. Overall, this is a good movie. It just isn’t Scorsese and DiCaprio’s best. If you’re looking for an entertaining thriller, then this is definitely worth seeing. Just don’t expect it to be particularly scary and try to ignore the climax as much as you can.